Miriam College Junior Marketing Association (MCJMA), a non-profit and a student-run official Marketing organization of Miriam College, has been holistically forming empowered and competitive future Market leaders through the years. This coming December, MCJMA will be having its one-night event called LUMIERE, previously called as Fellowship Night. It still has the same goal — to strengthen the bond of its members and intensify the organization’s external affairs. It aims to create and widen connections with other Marketing students from different colleges and universities. 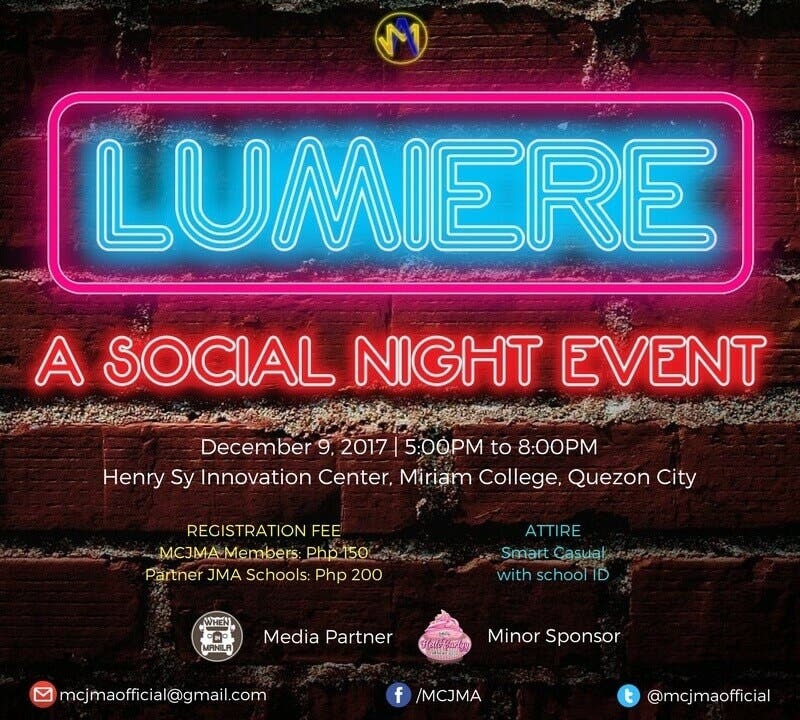 Unity, fun, and unforgettable memories will be missed in this event as the Katipunerang Marketistas and other Junior Marketing Association (JMA) organizations come together as the lights glow on December 9, 2017 (Saturday) from 5:00 pm to 8:00 pm at the Henry Sy Innovation Center, Miriam College, Quezon City. Burger Company Mystery Burger Festival: The First In The Philippines!